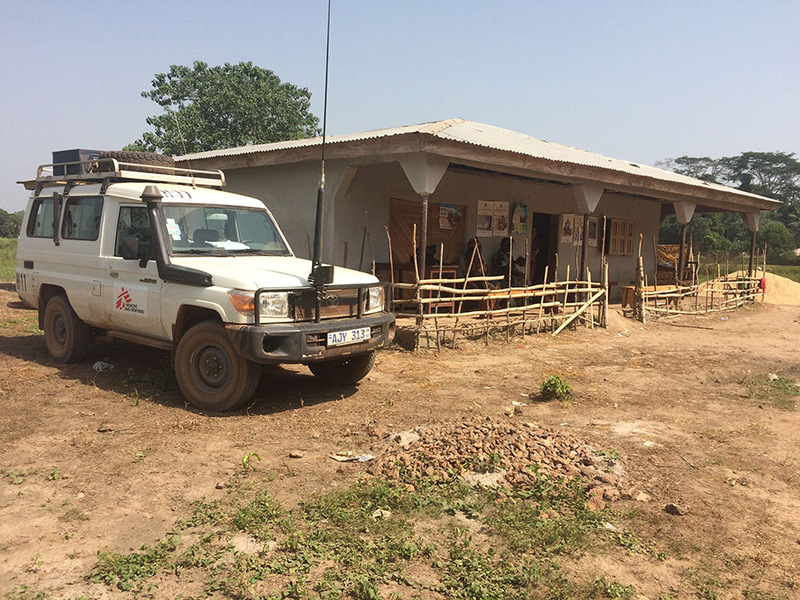 I’m on my way to one of the health posts Médecins Sans Frontières / Doctors Without Borders (MSF) is supporting in Sierra Leone. The journey is 30 minutes from the health centre in a land cruiser, 25 on a motorbike, and several hours on foot. Joining me are two Johns; our logistician assistant and our health promoter. Some of the staff complain about the road being uncomfortable. When we arrive I’m met at the entrance by Abu who is responsible for vaccinations in the clinic. He has a bucket in his hands which he lifts to eye level as I greet him. There is a large crack on one side. Abu explains that a goat cracked it with his horns. The bucket was used to store water for hand washing, and the goat wanted the water to drink. We laugh at this story, and I promise to bring him a replacement on my next visit. I say hello to Kumba the nurse, Rosalyn and Zainab the two nursing assistants, and Zainab our cleaner. These four plus Abu make up the team in Masengbeh health post. They spend their day reviewing children and mothers, referring the more complicated cases to hospital. John the health promoter will spend his day visiting homes in the village, whilst John the logistician has some work within the health post. The first task of the day is to collect tally sheets that record the medicines used over the last week. We compare this with the medicines yet to be used to create a list of medicines required from the store. Due to the lack of space in the health post, we created a medical store 100 meters away in the village school. We weave our way past school children who are playing in the field between the health post and school. The store is accessible via the head teachers his office, and I wish him a good morning as Abu, Zainab, logistician John, and I walk past his desk. He lifts his head up from some papers and smiles. Inside the store we have placed medicines on wooden pallets, a temporary solution to keeping them off the dirt floor. John uses his tape measure to obtain the width of the imaginary lines my finger paints on the wall. I hold a hand up somewhere above my head. John raises his gaze to my hand, then back down to my face. “Two meters. That will be four shelves”. I trust his judgement. He was a trained carpenter before MSF, whereas my only experience of woodwork was gluing together a letter rack in school some 18 years ago. I leave the room with a box of supplies in my arms. Abu locks the door behind me. A lesson taking place under the shade of a tree is briefly paused to allow the children to turn and wave at us as we exit. As I free an arm to wave back, Zainab takes the box from me and places it on to her head before I can refuse. We return to the clinic and put away the medicines. I bring a chair to the desk and sit with Kumba the nurse as she carries out consultations. We discuss the children who come in, and when the waiting area is empty I create fictional patients for Kumba to assess and treat. I’m preparing to leave when John the health promoter returns to the health post. Grasping his hand is a girl aged around eight. Her free hand holds her skirt off a bloody knee. She is wearing a school uniform and although her face is buried in John’s side, I see tears on her cheeks. “She was fighting with other children. Someone kicked her and now she is bleeding.” John shares. John walks the little girl home. Photo: Chris Sweeney / MSF. Rosalyn cleans and dresses the wound. The girl refuses to let go of John’s hand so he decides to walk her home. I join him and we walk in to the village together. The girls pointed finger guides us through the village and to her home. There are three women outside who start a conversation with John as we approach. One is the girl’s mother, and she puts her arm around her daughter as John explains what happened. We are being thanked by these three women when the car pulls up with the logistician assistant on board; it’s time to leave and start the bumpy journey back.